SkFuncs is a free Omnis xComp available for Windows only. It encapsulates some Windows functions which usually are only available by using the the Windows API and so are hard or even impossible to integrate into Omnis, depending on the complexity of the in/out parameters. So, if it comes to C++ like structures and typedefs, those functions cannot be used with Omnis‘ built-in Register DDL/Call DLL functions. Also, if a function works with callbacks and you have to pass the memory address of the callback function, Omnis Studio cannot handle this. SkFuncs is a wrapper for some of those functions and works with Omnis Studio unicode versions up from 4.x to 6.x and higher. It is available as 32-and 64-bit version (for Studio Unicode 5.x /6.x and above). The ZIP archive contains the 32- and 64-bit version. Custom xComp & External Development. Please look at SkFuncs as a proof of concept. If you need some particular funtion to be integrated into Omnis Studio, feel free to ask, an we’ll will give you a detailed proposal for implementing this function in a custom made xComp. 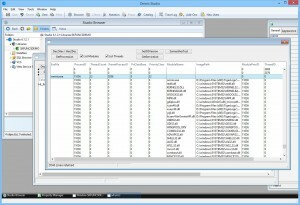 All functions of skfuncs.dll can be found in the Omnis Studio Catalog (F9) in the functions tab. SkFuncs is listed in the left pane, the particular functions can be seen in the right pane. 1. DecToHex Converts a given integer value into a hexadecimal number. Syntax: DecToHex (i_iDecVal,l_cHexStr) Returns lRet i_iDecVal: Long integer, value to be converted to hex l_cHexStr: Character, return value in hexadecimal characters lRet: Return value, ktrue if function successful, otherwise zero. Since Omnis Studio up to 6.1.x doesn’t have the neccessary entries in it’s manifest, it will always return 6.2. The function in skfuncs.dll will overcome this limitation and give you the correct version string, i.e „6.3“ for Windows 8.1 or „10“ for Windows 10. Converts a given hexadecimal value into an integer. Syntax: HexToDec (i_HexVal) Returns lRet i_HexVal: Character, hex value to be converted to integer lRet: Return integer value if function successful, otherwise zero. Returns a list of all services running under Windows NT/XP/2000/2003 with their service name and service state. The list passed as parameter doesn’t have to be defined, it will be done inside the function. Querying services on remote machines is available in skFuncs Pro (soon to come). Returns a list of processes running on the current machine. To retrieve a correct list of all processes (under Windows Vista and higher, i.e. all Windows versions with UAC built in) Omnis should be run with elevated user rights („Run as Administrator“). If bGetModules is set to kTrue, all modules including their image path etc. will be returned. If bGetThreads is set to kTrue, information about the process threads is retrieved. Querying processes on remote machines is available in skFuncs Pro (soon to come). Copy skfuncs.dll into the xComp folder within the Omnis application folder. The download of skfuncs.zip is free. 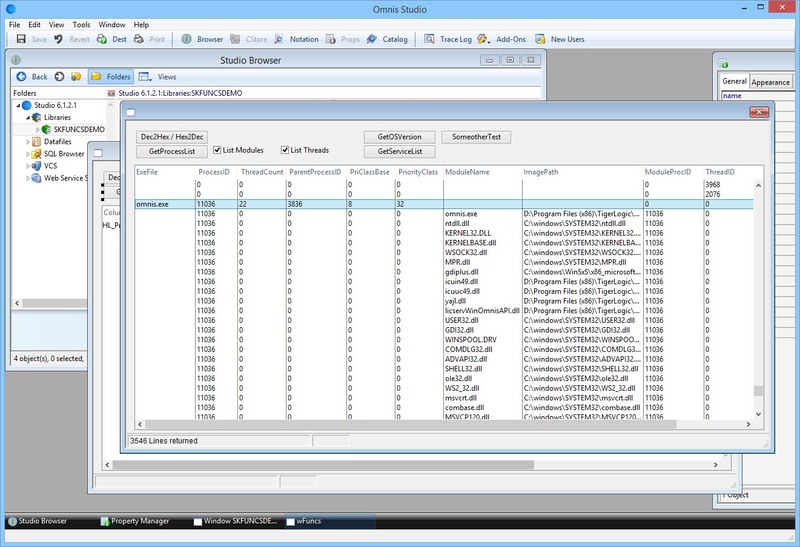 The download file contains the DLLs for 32 and 64 bit and a Omnis Studio demonstration library. After clicking on the „Start download“ button, an E-mail will be sent to the E-Mail address specified in the form below immediately after downloading.